Winners of a student competition for developing public media apps are awarded with publicity and meetings with system executives, but as last year’s team has learned, even a first-place idea can take time to catch on. This week, the victorious team in last month’s Donald W. Reynolds Journalism Institute Student Competition will meet in Washington, D.C., with representatives from PBS and NPR to promote their new app. SoundStir, which the team created in January, is an Android-based media player that draws from the Public Media Platform, a hub of digital public media content. The app allows users to create playlists and start discussions with other users who share similar interests. The RJI contest, now in its third year, brings together teams of students at the University of Missouri to develop PMP-based apps. SoundStir’s team members developed their app in January and have been tweaking it since winning the competition, said Kristofferson Culmer, a candidate for a doctorate in computer science and a member of the SoundStir team. Upgrades so far include including fixes to the app’s algorithm that matches users. “We have ideas how to make it even better in versions 2.0 and 3.0,” he said. Culver’s team also included journalism students Alix Carruth and Rachel Koehn, computer science master’s student Manav Singhal and computer science doctoral student Son Nguyen. They’re optimistic that they’ll find a way to keep SoundStir moving forward, maybe even by partnering with a public media organization. But finding a buyer or partner is not a sure thing, even for competition winners. Among the mentors at this year’s contest was Jack Howard, a junior at the University of Missouri who also reports for KBIA-FM in Columbia. Howard and his team won last year’s competition with My2Cents Radio, an Android-based app that allows users to create playlists of public radio programs and give money directly to the shows’ producers. Despite Howard’s tireless pitching, he has yet to find backing to support the app’s expansion. 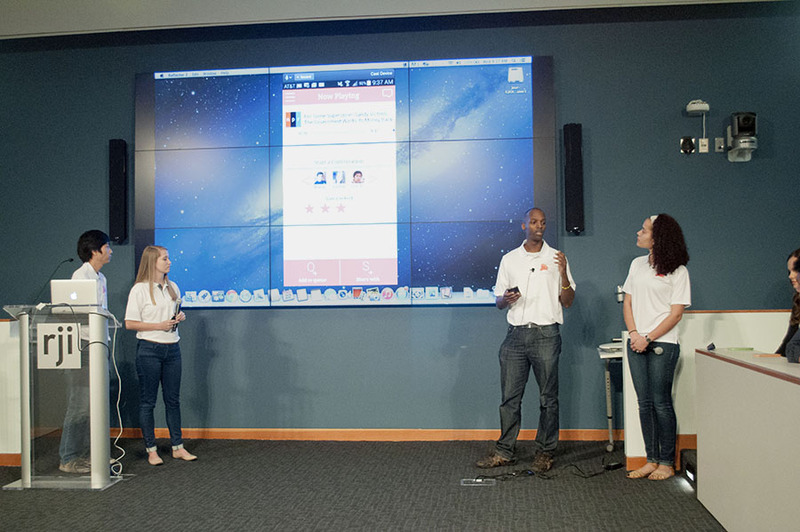 Howard and his team also got the chance to promote the app to public media executives and commercial enterprises. They’re still working on the app, including developing an iOS version, but have yet to find a partnership, in part due to fears among stations that use of the app could cannibalize their income. “A lot of the system didn’t like My2Cents, I think, because they thought it was cutting into their revenue,” Howard said. Howard also ran into challenges as he tried to develop a frictionless way to move money from listeners to producers. It’s been harder than it sounds, he said. “When I imagined My2Cents, I didn’t imagine it as a business model,” he said. “I just assumed if you wanted to give people money on the Internet, you could. One of the problems I never foresaw was getting people to accept money — it was tougher than expected.” A workaround allows users to buy virtual coins that are batched and sent to producers. My2Cents would then cut the checks. The app went through a round of beta-testing with 20 University of Missouri students but is not yet available in Android’s app store. Howard said he now knows that people need more of a reason to listen and give. “You have to lead the horse to water and get it to drink,” he said. Yet Howard continues to promote My2Cents and has met with companies including Google and BuzzFeed. “By no means have I been discouraged from pursuing My2Cents — I still pitch it to people all the time,” Howard said. Founding members of the PMP will continue to advise on its development.